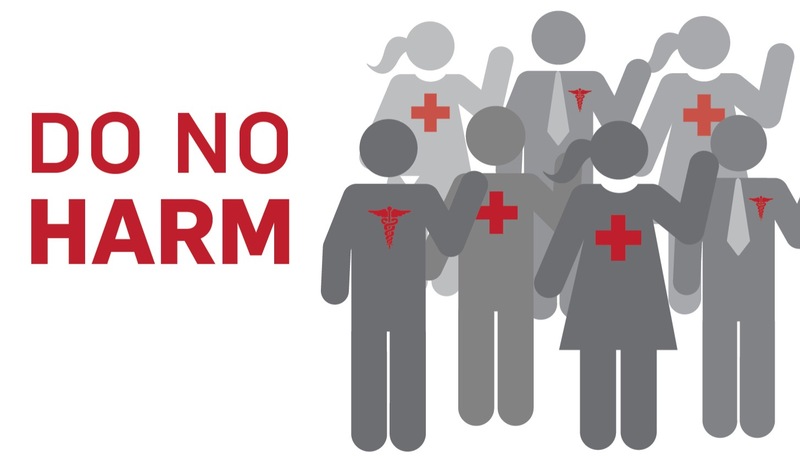 “Do no harm,” is part of the oath that all medical students must take. It’s supposed to be an essential part of being a doctor–to not do any injury to their patients. But it’s a sad fact that too many doctors forget that by ignoring or not treating their patients’ pain, they’re actually doing just that–harm. And not only is untreated chronic pain detrimental to a patient’s health and quality of life, it also affects them emotionally. I’ve had a lot of bad experiences with doctors as I have several health conditions, but recently, I had perhaps my worst. Two years ago, I developed a headache that has never gone away. I was finally diagnosed with new persistent daily headache–NPDH–which is a fancy way of saying, “you’re screwed.” NPDH is symptomatically very much like a constant migraine–complete with light and sound sensitivity–and yet its etiology is likely different. So treating it with the only arsenal we have–migraine medications–isn’t very effective. I’m further limited by what treatments I can try because of my other health issues and allergies, but even so I’ve tried, to date, more than a dozen medications. None of them were effective, and several I was forced to stop because of intolerable side effects. (Talking about that is enough for its own blog post.) I’ve also tried acupuncture, massage, adjusting my diet, special glasses, Botox, and the transmagnetic stimulator (TMS) device. I may get a small amount of relief from one treatment or another, but it’s almost always temporary and the headache never, ever goes away. Nor does the light and sound sensitivity. The pain can be anywhere in my head or neck, or everywhere; it’s not consistent from minute to minute, let alone day to day. It can be pounding, pressure, stabbing, aching, burning, and everything else you can probably imagine. Often it feels like my head is going to explode, the bones of my face are on fire, and the ear pain is like I’m stuck on an airplane and can’t pop my eardrums, all while every single tooth has decided to give me the worst toothache of my life. Some days my scalp hurts so much I want to shave my hair off because even the weight of it (and it’s not very long) is too much. Occasionally, my eyeballs will hurt in a way I never thought possible. Sometimes I can barely breathe or talk or blink because any movement of my face is excruciating. And this is every day, with little I can do to stop it. It’s a sad fact that too many doctors forget that by ignoring or not treating their patients’ pain, they’re actually doing harm. Fortunately, the TMS device does seem to help a little. It can help take me down maybe one or two–if i’m lucky–points on the pain scale, which doesn’t sound like much but can be a life saver. The past few weeks were particularly bad, with my pain staying mostly in the 8s, 9s, and 10s. A couple nights ago I had a very busy, long day (something I usually try to avoid), with lots of sitting under fluorescent lighting, and that evening my headache spiked to unprecedented levels. I would have rated it an 11 on my 1-10 pain scale. I was ready to go to the ER, even though I’m loathe to do so because I’ve had bad experiences before, but I was that desperate, and in that much pain. Fortunately, the TMS device brought the pain down just enough I could survive it. The next day I had my appointment with my neurologist, the one guiding light in the darkness of the past few weeks. I’d been skeptical about him for months, and already had an appointment with another neuro scheduled (she takes half a year to get in to see), but I was trying to remain hopeful. Things couldn’t have gone worse. My pain was particularly high, so naturally, my blood pressure was slightly elevated because of it. When my pain is at decent levels, my BP is very good (~118/75), but when my pain spikes, so does my BP. I’ve known this for a decade. Yet my doctor immediately accused me of being hypertensive and that I needed to see my PCP right away. When I tried to explain, he then pointed out how I was on a blood pressure medication as proof. I reminded him that he had prescribed that as an attempt to control the headache, and that I needed to stop taking it because it made my heart race out of control. He then insisted that my BP was high because I’d stopped taking the drug. I insisted it had been months since I stopped it and I’d only taken it a few weeks, and I’d been to several doctors since with no BP issues. Things just went downhill from there. I tried to explain how bad my pain had been recently, how severe it was the night before, how I’d been unable to sleep for at least two weeks. I asked him if there was anything else he could give me to take at night so I could sleep, because I was hopeful that if I could manage my pain at night, the TMS device would work better at managing my pain during the day. He insisted he couldn’t give me anything else. I explained the medicine he’d given me before had stopped working (unfortunately common in my condition), and I was desperate for sleep. He again insisted he couldn’t give me anything. When my husband offered a few suggestions, including some sleeping pills, the doctor grew angry and said he didn’t prescribe anything that was potentially habit-forming. He then snidely remarked he could refer me to a pain specialist, and I explained that I already had an appointment for one in a week. His attitude got more condescending as he informed me that they would probably just “get me addicted to something,” and then left to mix up my Botox treatment. I’m not interested in getting high; I’ve never asked for narcotics. I just want some relief so I can function, even if it’s on a small scale. Is that too much to ask? The rest of the visit I tried to control my anger as he gushed over a new nasal spray version of a short-term migraine drug I’d already tried and abandoned, proclaiming how I could use it “eight times a month!” I replied flatly, “Wow, eight times a month, amazing.” (Triptans are designed to stop a migraine attack when taken at the onset, so for someone like me, with a constant, non-migraine headache, they aren’t effective. I can’t even take it every day, so the drug is really totally pointless for me as it barely touches my pain and lasts maybe two hours at most.) That moment was the one in which my heart totally sank because it was clear he didn’t believe my headache was constant, that the pain was so severe, and he was going to do nothing to help me. My heart sank because it was clear he didn’t believe that the pain was so severe, and he was going to do nothing to help me. It was almost as if, because I’m so seemingly high-functioning even at my upper pain levels, he just assumed I was exaggerating. It’s not like I have a choice. I can’t tell my pain to stop because I have to go to the doctor or I need to take my dogs to the vet. It takes a lot of strength–as I’m sure those of you who deal with chronic pain can attest to–to push yourself through it and do what needs to be done despite how much you may be hurting. For a doctor who is supposedly an expert, he was particularly unsympathetic as to how invisible an illness chronic headaches can be. I’ve been seeing this doctor for a year, and he made it clear that he’d never taken my condition seriously. It was such a blow and a betrayal. Suddenly, a week felt like such a long, long time to wait for that pain management appointment. Fortunately, that appointment went much, much better. She actually listened to me, acknowledged I’d already tried everything “obvious” for headache pain, and then said with wide eyes, “And you STILL have pain after the Botox!” And then she gave me some very reasonable solutions to try for a month. After ONE DAY the combination of the new medications, plus the Botox and the TMS lowered my pain to unprecedented levels. It felt like having a new lease on life and made me even more angry with my neurologist for not offering me more aggressive help sooner. I still have pain and light/sound sensitivity, but at least I can function and–most importantly–sleep–and honestly, I think that’s a huge part of why I’ve been feeling better. My point is, if you’re suffering with chronic pain, don’t give up, and don’t be afraid to search out other options. If you have a doctor you can trust for advice, see if they can recommend a good, ethical pain management doctor, and go see them. If anything, they might give you back the single most important thing chronic pain robs you of: hope. This entry was posted in Blog and tagged Bad experience, chronic pain, do no harm, NPDH, Pain management. Bookmark the permalink.